Pet steps and cat nappies! It’s inevitable that age will take over at some stage with our beloved pets and they WILL need a helping hand with getting up to those comfy armchairs, sofas and beds that were once so easy to climb/jump onto. 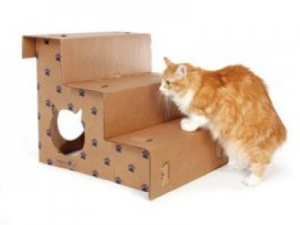 Several clients of mine, who have older cats with mobility problems, had no idea that help is out there in the form of pet steps! Take a look at the huge variety of steps for different purposes like reaching the sofa, bed, or even a mobility ramp for getting in and out of the car. Here’s a selection hand picked for the Catnips Store. under The Health Section. Also, if your cat becomes incontinent there is also help at hand in the way of cat nappies!! Yes! One site that offers these can be found HERE. The site is for dogs and cats who suffer from faecal or urinary incontinence and is the best option over having to give your cat up or have them put to sleep. Hooray for quick thinking humans to solve this problem!